The old town Center for the Five Stars hotels, the Central Station for the four stars and the Third Circle for the three stars; according to the Hotel investment Appeal Index made by World Capital, these are the areas of Milan with the highest level of attractiveness in the Hospitality real estate. Being one of the most important cities of Italy, because of its position as Business and Fashion capital city and thanks to the prestigious monuments that it owns, Milan is particularly appealing in terms of Hospitality and for these reasons, it attracts an increasing number of foreign investors oriented to the Hotel sector. World Capital, international society specialized in real estate expert advice and management, in order to supply actual datas and concrete business opportunities in the Hospitality sector, has developed the Hotel Investment Appeal Index, a tool made to identify the real feasibility of the introduction of many activities relating to Hospitality in a specific territory. 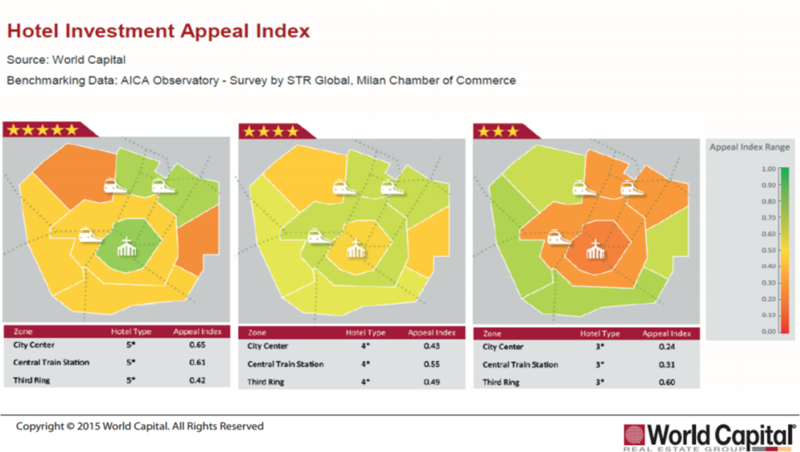 The fulfilled study, underlines the old town center of Milan as the most attractive area for the five stars Hotels (0.65), the Central Station area for the four stars (0.55), while the Third Circle area for the three stars (0.60). Interesting also for the five stars category the Central Station (0.61), and for the four stars the Third Circle (0.49).